By systematically deconstructing and analyzing scientific texts for irrational unconscious motivations, new scientific associations can be produced. Four categories are suggested as guidelines for the analysis of science: metaphors, scientific parapraxes, lacunae, and scientific myths. The most important are the conceptual lacunae, for they constitute an integral part of the scientific construction. Three types of lacunae are discussed, each deriving from a different hidden motive: (1) The blurring of a scientific problem in order to preserve the intactness of a theory (the post-traumatic dream); (2) The epistemological double split which reflects the discrepancy between what we wish to see and what we actually see; and (3) The difficulty of dealing with phenomena that evoke deep, primary fears (phantasies about the inside of the body). Examples from various disciplines are discussed in order to show that unconscious elements in science are a universal phenomenon. The function of scientific myths is explained. And the hypothesis is tested on psychoanalysis itself, in this way providing a full explanation of how and why blind spots block scientific creativity. 1 Why a Psychoanalysis of Science? Stein’s book, in the stream of a tradition that is almost lost today, i.e. that of Gaston Bachelard, Louis Althusser and very few others, confronts an extremely interesting challenge: that of analyzing the impact of Freudian unconscious on the scientific creativity processes and on the scientific discourse. As the author himself remarks, this work could be only completed through an interdisciplinary research. In order to do so he takes into consideration an exhaustive psychoanalytical and epistemological bibliography. The result is a very original and coherent proposal. While psychoanalysis analyzes cultural phenomena, the psychoanalysis of science remains a lacuna. 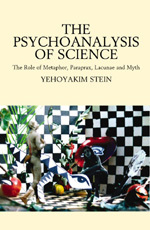 In this outstanding study, Yehoyakim Stein paves an innovative path to exploring scientific development, demonstrating it on the psychoanalytic discipline. He sheds new light on hidden motives, loyalty conflicts and unconscious anxieties which cause stagnation and blind spots in psychoanalysis, and demonstrates these motives on the body image, trauma, drive theory and the place of the logos in psychoanalysis.